This is a 12x18 white cake, torted to make 2 layers, filled and iced with white buttercream. It was served on a foil covered piece of foam core. I made the hive and the bees a week ahead of time to give the parts time to dry completely. To make the hive, I used the top half of a plastic Easter egg. I cut a piece of cardboard to fit the bottom opening. I covered the egg with piping gel and then with fondant, wrapping the fondant around the bottom edge of the hive. The fondant was rolled thicker than usual (at least a quarter of an inch thick) to prevent it from tearing. After the hive was covered, I used the veining tool to mark lines around the hive and the entrance, then painted the lines to make them stand out. To make the bees, I cut out the wings using the exclamation point from an alphabet cutter set and set those aside to dry. I saved a portion of the yellow fondant to attach the wings once all the parts were dry. To make the bodies, I pinched off a piece of yellow fondant and shaped it into a cylinder. I lightly squeezed the fondant to make a neck, forming a head and a body, then squeezed out a section to make the stinger. I placed the bodies on parchment to dry, turning them every day to dry evenly. When the bodies were dry, I rolled out the black fondant very thinly and cut it into narrow strips. I attached the strips to the bodies by brushing the strips with vanilla extract then placing them. To attach the wings, I rolled tiny balls (the size of the tip of the wing) of the reserved yellow fondant and attached the balls to the bodies, brushing them with vanilla extract. I brushed the wings with the vanilla and attached them to the top of each ball. I rolled out the green fondant to fit the cake then used a decorative roller to create a texture. I used that roller a few times to make the pattern less distinct. I covered the cake with the fondant and trimmed it to size. I made the flowers for the top and border using 3 sizes of a flower cutter and attached them. 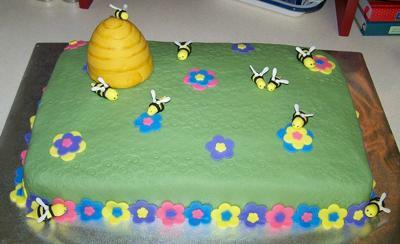 I brushed the fondant edge of the hive with vanilla and attached it to the cake. I brushed the bees with vanilla and attached them. The small bee on top of the hive needed to be held in place until the vanilla dried and the bee was stable. Thank you all for your kind words. You're doing wonders for my ego! I love the egg idea too!